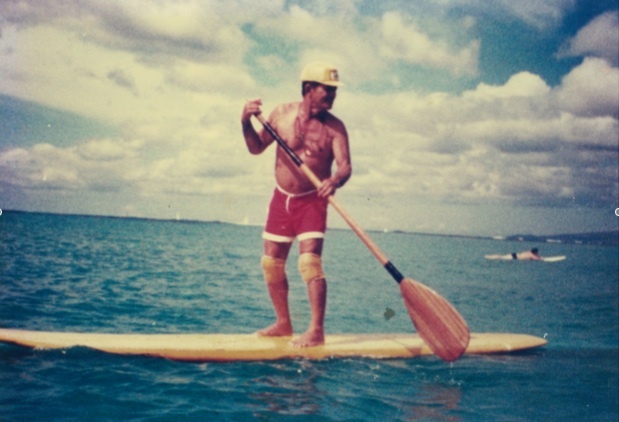 The John "Pops" Ah Choy Foundation was created on June 3, 2010 to honor one of the great men who started the sport of stand-up paddle surfing in hopes to continue his legacy for the future generations of surfers in Hawaii and throughout the world. Proceeds from our event will aid local charities and provide scholarships for students. This year we have chosen the Alzheimer Association of Hawaii as our charity. Scholarships will be created and available for student athletes in water sports who wish to continue their education after high school. This competition features shortboard, longboard, and SUP divisions, and will be held May 6th and 7th, 2017 at Kuhio beach. June 24th & 25th, 2017!! This year's contest is right around the corner! We will be holding our 7th Annual John "Pops" Ah Choy Surf Fest on June 24-25, 2017. We have added new divisions, including a TANDEM PET DIVISION and a 4 EVENT LEROY AH CHOY WATERMAN COMPETITION. Come down and join us for a fun-filled weekend of surfing and music. This all noserising competition features team and individual division. The contest will be held at Queens on Waikiki Beach July 8 & 9, 2017. John "Pops" Ah Choy was born in 1920 in 'O'okala on the Big Island of Hawaii. He was the third eldest of 13 children. At the age of 12, he had to leave school to work on the sugar plantation to help his family. John married in 1938, and had three children: Suzanne Young, Bobby Ah Choy, and Leroy Ah Choy. A few years later, in 1943, he arrived in Honolulu looking for a better way of life for his family, securing a job at Pearl Harbor as a crane operator. Soon after, he began working for Hawaiian Electric where he would retire after 37 years of service. Along the way, he remarried, and had three additional sons: Ricky, David, and Michael Ah Choy. The family resided in Waikiki, two blocks from Kuhio Beach, which became the Ah Choy playground. John "Pops" Ah Choy started surfing at Waikiki at well known surfing spots, Queens and Canoes, in 1944. During this time, he raised six children; two of his sons became legendary Beach Boys. Bobby and Leroy Ah Choy both completed the Molokai Canoe Races during the 1950s and 60s. Both were Master Steersmen and water men, competing in tandem and stand-up surfing championships. Pops never missed a day of being in the water whether surfing or paddling in flat conditions. He was also very inventive. In the 60s, the family lived two blocks from Kuhio beach and would carry their surfboards (longboards weighing up to 80lbs.) there, sometimes tiring out before ever getting in the water. My dad decided that there must be an easier way to get the boards to the beach. He created a surfboard wagon that could hold and pull up to 8 longboards. He also designed his own leg leashes. In the 1970s when skateboarding took off, he cut and shaped wood and fiber glass skateboards. He also created a chair with suction cups to place on the longboard when using it to fish. Later, Leroy and Bobby used this technique in their photo business of taking pictures of tourists surfing at Waikiki. Eventually Pops decided to use a canoe paddle, knee pads, and a Hawaiian Electric hard hat when surfing. He would keep his cigarettes in the hat so they wouldn't get wet, and would also smoke a cigarette or two between sets. When his knees began to bother him as he got older, instead of kneeling on the board he decided to stand-up and paddle while surfing. That was in the late 60s, which is how stand-up surfing began. Later my brother, Leroy and Bobby, adopted the idea and used it once again for picture taking of tourists at Waikiki. John "Pops" Ah Choy stand up paddle surfing at Waikiki.